Claire produces hand built sculptural ceramics and uses a variety of experimental firing techniques. She creates work ranging from small creatures to large-scale pieces for courtyard gardens, outdoor locations and contemporary living spaces. She utilises a range of hand building methods adapting coils, manipulating soft slabs, pinching and carving the surface to achieve her desired forms. 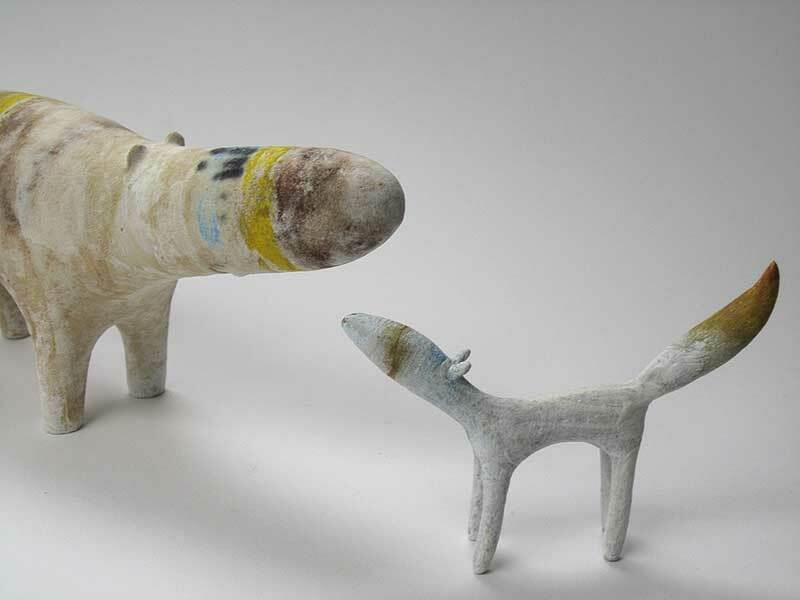 Claire uses stoneware bodies and often porcelain for smaller work. She paints the pieces with engobe, oxides and body stains and fires to 1260 to achieve a weatherproof structure. She uses her unique studio location at the London Museum of Water and Steam to inspire her work. There she can experiment with smoke firing techniques to achieve an alternative surface, which involves pit and saggar firings using sawdust, copper wire, seaweed and other combustible materials. She will often create a series of small sculptural forms that serve as working maquettes. Her large final pieces interplay three-dimensional form with texture and glaze. An experienced tutor, she specialises in contemporary ways of making.